The concept creates a win-win situation for all---developers, hoteliers, and retailers. There is an evolving trend in the retail real-estate industry, wherein we see boutique hotels or five star hotels opening in the same complex as the popular malls across the country. Be it Lemon Tree at Pacific Mall, Kaushambi; Ista at Alphaone Mall, Amritsar or Svelte at Selectcity Walk, New Delhi. Having hotels and malls in the same premise is a new wave of change. This concept is very popular in the west, not only among big developers but also small ones who develop motels. Everyone stops by a mall be it for grocery shopping, leisure trip or just to have some good food; so being present along-side a mall is definitely a profitable venture for hotels. “This concept caters to the growing demand for multi-utility developments across the world, where one can combine retail experience with the option of lodging/ staying at the same venue. Rising real estate costs and lack of good locations in cities are driving hotel companies to rent space in malls and other commercial complexes. It’s a win-win situation for hoteliers and mall developers as well as retailers. The hotels take off quickly in the vicinity of a commercial hub,” says Prodipto Sen, VO Marketing, Retails and Corporate Affairs, Alphaone Mall. When two major business ventures like malls and hotels come on the same plane, what advantages and disadvantages surround them? Is the benefit similar at both the ends or tilts more towards one? “There are several advantages for hotels in being near a mall; it provides shopping, eating and entertainment options, to the guests of hotels, in proximity,” says a spokesperson for Selectcity Mall. That sure helps having everything at arm’s length; one doesn’t need to think of the immense travel before stepping out of a hotel room, which is a major concern in big cities. The industry insiders say that budget hotels are a better option than five star hotels as most of the value malls have no-frills brand. Does the presence of a mall alongside calls for a change in the targeted audience for a hotel…considering a five star hotel and a mall may not share a common TG? This brings to the point that the concept may compel the malls to consider the retailers thoroughly before leasing/ renting the space. The spokesperson for Selectcity Walk says “It depends on the catchment area of the mall and equally on the brands available and category of hotel.” The more the variety of brands the more the category of visitors! If you have a five star hotel by your side, the inmates of the hotel won’t like to see a value mall they would be more interested in luxury shopping. In this concept, the hotel is involved at the planning stage and works out on the floor plan with the developer before the latter begins construction of the mall. The most common model for the concept is that the hotels rent the top floors of the mall. All lower floors will have a high end retail area open to visitors in general. The hotels have a separate entrance driveway and elevators for their guests. Maximising the sales is the mantra of the concept, mixing together the best solutions in entertainment, stay, comfort and food. “Although being attached to a mall may increase footfalls at an early time, it needs to be matched to what perception the hotel would like to create. Also the desired positioning of the hotel plays an important role in this decision to pair up or not. The average five-star consumer may still benefit from going to a classy hotel with high-end retail stores rather than an average mall with a classy hotel. Which is a trend that’s prevalent abroad, however new trends emerge and we must change with them and continue the learning process” enlightens Sen. The cost factor works in favour of hoteliers. For instance, on an average a stand alone ginger hotel having 100 rooms will require (discounting the cost of the land) anywhere between Rs 13-15 crore, whereas opening up in malls would require an investment of around Rs 9-11 crore, for space. The hotel saves around 30 per cent in the latter case. The concept has immense potential. 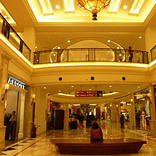 LuLu Shopping mall in Kochi is the next to join the list of malls that enjoy the presence of luxury hotels!